Acting as a calibrating device at the point where natural environments, enormous sociotechnical forces, and evermore “technological species” converge, Technosphere Magazine traces the mechanisms of the Technosphere. It investigates specific dimensions, “apparatuses,” ruptures, and operational failures through and by which the technosphere becomes visible. How does the technosphere operate? What are its organizing principles and infrastructures? And how will we work amidst these new forms and constellations of humans, technology, and Earth systems that the technosphere spawns? 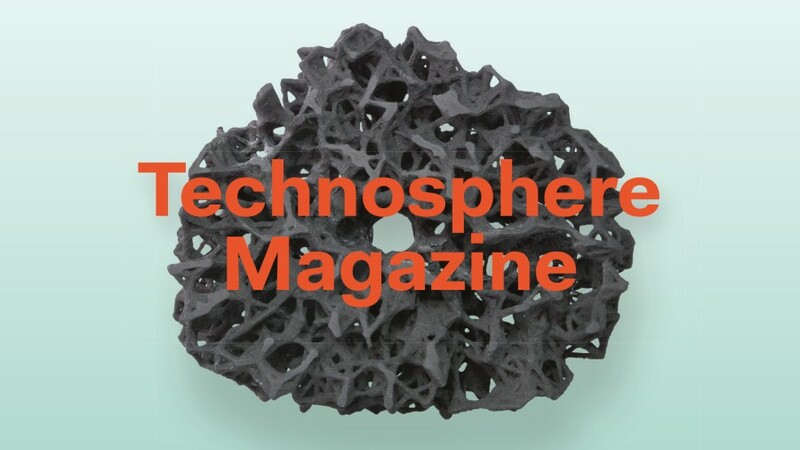 Over the course of the research project Technosphere (2015-19), the online magazine ties together research pieces, philosophical essays, and artistic approaches in curated thematic dossiers, thereby mapping out trajectories and converging points within the technosphere. Between autumn 2016 and spring 2019, eight to ten dossiers will be released each year. The advent of synthetic listening might profoundly disturb the sense we have of our own aurality. This dossier focuses on computer audition tools which are modeled after human listening. If machines listen differently than we do, how might we characterize such listenings? What might computer audition tell us about our own human forms of listening? Ever since the late nineteenth century, the Arctic has been a focal point for the advancement of technology, geopolitics, and research imaginaries. How has the Arctic region, a highly engineered and technically activated space, become a laboratory of the technosphere? This dossier looks at the multiple historical and current registers of contention over a dramatically changing region. Trust is a pillar of the technosphere. It keeps the flow of goods, ideas, and policies circulating and provides orientation and managerial scaffolding to all kinds of relationships, keeping them intact—until they break. This dossier explores how technology influences the establishment of trust relationships in our sociotechnical world. In addressing the technosphere, almost all attention is drawn to the techno. But what about the sphere? How do we approach this notion of an Earth-scale envelope embodying the technological condition of our planet? The dossier seeks to circumscribe and visualize the spatial forms and parameters of this technological megastructure. The whole technosphere rests on the mobilization and organization of (energetic) matter. This dossier discusses the criticality of the material world as the spatio-temporal backbone of the technosphere, presents stories of stuff from mining to discarding, and explores the blurring lines between naturalness and artificiality. Systematic borders are the inner scaffolding of the technosphere, determining flows of goods and people, negotiating relations, and maintaining the formal ecology of processes and things. This dossier explores the many direct and indirect technological means used to enforce rigid border structures, questioning both the efficacy and rationale behind such borders. Risk equipment is the way in which we plan for contingency. From financial tools to scenario modeling to concrete landscaping, the planning apparatuses explored in this dossier attempt to stabilize the unstable through projecting information in anticipation of possible hazards. Creolized technologies are technologies that go through transformations and inversions, making their standard forms and functions more applicable to a local set of necessities. The dossier looks at how these local particularities and relations resonate as écho-mondes that reflect back local dynamics, modulating technological usage in such a manner that the technologies themselves are irreversibly transformed. The concept of the human is a category of precarious construction. This dossier pursues the muddling effects of the technosphere as an arena where concepts about the human converge, diverge, and evolve well beyond their original motivation. This dossier explores the recomposition of interconnected economies, legal frameworks, and environments along the liminal spaces that blend land and sea into one another. It navigates between reshaped waterfronts and river systems, to global oil port infrastructures, to the impact of urbanization on river deltas, and from the construction of artificial islands to the territorial politics that exploit these shifts in landform. The world economy ‒ and the planet’s entire human population ‒ depends on a wildly unappreciated resource: phosphorus. Forged by an improbable sequence of nuclear reactions in exploding stars, phosphorus is the most cosmically rare of the six elements needed in large quantities to produce life. Modern life depends on its industrial circulation. It is thus a particular nuanced element for illustrating the globalizing reach of the technosphere. One more speculative way to understand the intertwining of biological and technological forces is in understanding the technosphere itself as a form of trauma. Freed from its hackneyed psychoanalytic treatment, the notion of trauma might be an accurate description of a general process of recursion, iteration, and memory that is inherent within the relationship of technospheric infrastructures, cultural inscriptions, and the supple physicality of the individual. Infrastructure could be understood as a crystallization continually forming the technosphere. It functions both as the glue to the different parts of this man-made sphere, but also mandates the way certain systems are controlled or made possible. Human techniques and behaviors are only as viable as the infrastructure within which they are set. This point is particularly salient as increasingly more devices and apparatuses are tied together. The third innermost large body in this solar system is ripe with a grand composite formed by the local stew of cosmological, geophysical, and biochemical forces and developed through a long evolutionary process. The technosphere ingresses into this complex interweaving, hijacking the Earth system and modifying it in unforeseeable ways. Among the bits of matter and energy it refashions are some of the fundaments of life and non-life on Earth. Physically ingrained practices and routines are a subtle yet decisive precondition for perceiving, coherently grasping, and adequately responding to the more-than-human dynamics of a global environment in transition. Understanding, reshaping, and modifying these regimes of epistemic authorities, sense training, ascetic modes of inquiry, and techniques of mental cultivation is required in light of the technospheric age.